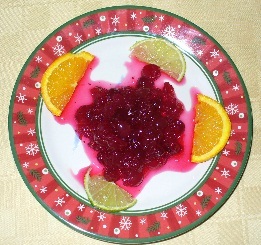 In addition to the great taste of this holiday side dish, part of the pleasure is in the preparation and the wonderful scent of fresh oranges and limes. Combine all ingredients in a heavy pot and bring to a boil. Reduce heat to medium/low and simmer until berries pop open. Skim off foam. Cool to room temperature or chill. The zest is only the thin bright colored skin of the orange and lime. Beneath the skin is actually the pith which is bitter. Be careful to just get the zest for good flavor. Enjoy!